The global market for antiviral drugs has been studied at length in the research study that has been recently published by Transparency Market Research. As per the study, the global antiviral drugs market is moderately consolidated in nature with a high level of competition among the leading players. With the rising number of mergers and acquisition and strategic collaborations, the market is projected to witness a high degree of consolidation in the next few years. The key players in the market are focusing on the expansion of the product portfolio and research and development activities, which is projected to enhance the growth of the overall market in the next few years. In addition to this, the launch of new drugs is projected to offer growth opportunities for the market players in the next few years. Some of the leading players operating in the antiviral drugs market across the globe are Merck & Co. Inc., Johnson & Johnson, Teva Pharmaceutical Industries Ltd., GlaxoSmithKline Plc, and Mylan N.V.
As per the research study by Transparency Market Research, in 2015, the global market for antiviral drugs was worth US$48.3 bn and is projected to reach a valuation of US$82.9 bn by the end of 2024. The market is estimated to register a 6.40% CAGR between 2016 and 2024. 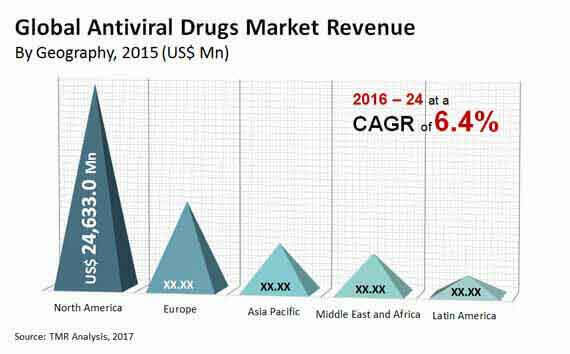 In the last few years, North America held a large share of the global antiviral drugs market and is predicted to remain in the leading position in the next few years. Most of the leading players have their headquarters in this region, resulting in high spending on research and development activities. This is projected to encourage the growth of this region in the next few years. In addition to this, the rising purchasing power of consumers and the high cost of new drugs are predicted to support the market growth in the coming few years. Europe is projected to take the second position in terms of market share, thanks to the advanced diagnostic facilities. Furthermore, Asia Pacific is likely to witness a fast growth in the next few years with the development of the healthcare infrastructure and the rising disposable income of consumers. In terms of disease indication, the global market for antiviral drugs has been divided into HIV infection, hepatitis viral infection, respiratory viral infection, and other types of infection. Among these, the HIV infection is expected to hold a key share of the global antiviral drugs market and observe a high growth in the next few years. A substantial rise in the incidence of HIV infection is one of the key factors that is projected to accelerate the growth of this segment throughout the forecast period, states a TMR analyst. The global market for antiviral drugs is expected to gain traction from developed economies, especially from North America. The rising focus of the players on technological advancements and innovations in this field are projected to support the growth of the overall market in the next few years. Several emerging economies, such as China, Japan, and India are estimated to offer potential growth opportunities for the market players, thus accelerating the growth of the overall market in the next few years. In addition to this, the rising government support is predicted to enhance the growth of the market in the next few years. On the flip side, the exorbitant cost for drug development and the increasing inclination of consumers towards natural products are considered as the major factors that are predicted to hamper the growth of the market in the near future. Nonetheless, the rapid development of the pharmaceutical and healthcare industry is projected to encourage the growth of the global antiviral drugs market throughout the forecast period. North America is likely to lead the global antiviral drugs market further followed by Europe and Asia Pacific throughout the forecast period. Rising government support for research activities and drug development to accelerate the growth of the market in the coming years.